It's where she was yesterday, and the day before that and before that, and... well you get the picture. Instead of going out and exploring trails and visiting the farmers market she has sat in my garage gathering dust and bugs. See when Huffy asked me to participate I was genuinely excited about the prospect of a bike and riding. The thought that I would have a baby never crossed my mind. I used to work out and run when I had my other babies so fitting it in didn't seem like it would be a problem. 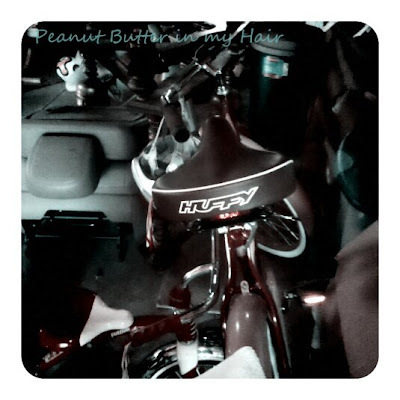 My kids had just gotten bikes and I had visions of us all riding off together through the wooden trails near our home. PBbaby won't take a bottle. After school/work is a fussy time for her and if she is not with me she is crying and fussing. So I can't leave her with my husband (or a sitter) and go ride because she just cries (or screams) and diner doesn't get made. I looked into getting a trailer but Georgia is a single speed. According to my husband (who does understand Physics, unlike me who faked it) and the guy at the store I probably wouldn't be able to go anywhere with the trailer attached because it would be to heavy/too hard to pull. It's been so beautiful here too with gorgeous perfect sunny 70 degree afternoons. I want to ride. Not just because Huffy expects me to but because it was fun. 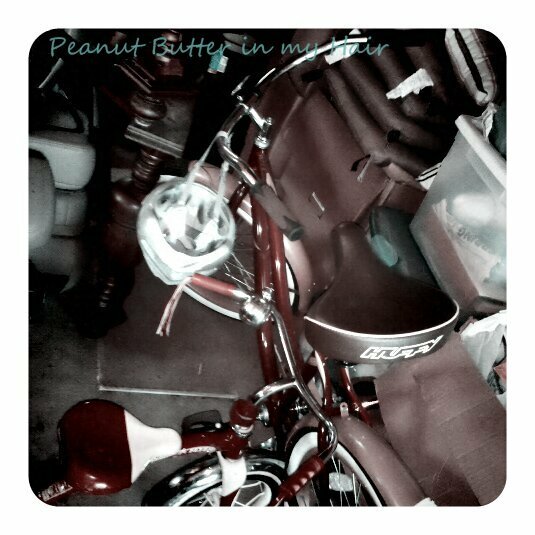 Huffy didn't send me the bike so I would blog about it, they want moms to get out on the bikes and ride. Take time for themselves or take time for family and get out from behind the screens and ride. I am determined to not let another beautiful weekend pass without a ride. This weekend I am am going to ride it to my local bike shop (while PBbaby is napping) and see about getting a seat for her. Since she is sitting up on her own now I think that might be the best way for me to get out there and actually ride. Because Georgia, she wants to ride! If you have three (or more) how do you fit in/find time for fitness and taking care of you? Disclosure: I was sent a bike and helemet to particpate in it's Mom's on Bikes campaign. all opinions expressed are my own. Joanna Goddard from A Cup of Joe just did a post about front riding bike seats for babies. They look pretty cool. I only have 2 kids, so I hope you don't mind if I answer your last question. I usually fit in exercising by doing an exercise DVD on my laptop, in the living room in the evening, while my husband and I watch our regular tv shows on the big tv. I almost mute the DVD on the laptop, because who really wants to hear the repetitive music and encouraging words of the trainer, and I still get to hang out with my husband, and if the kids call I am still in the house. My other favorite is to take the dog on a walk with the kids in tow, although we don't move very fast so I don't feel I get as much exercise. BTW, my husband pulls the bike cart with his beach cruiser, and it works out ok. Even when my 7 year old son insists on riding in the cart, too!